Cut and rinse cauliflower florets well in water. Add them to hot water and set aside for a while. Drain the water. Steam or cook potatoes and cauliflower until half cooked. I usually steam them in a pressure cooker. Bring 2 cups water to a boil in a cooker or steamer. Add the cubed aloo to a steam basket and steam them until half done. Then add cauliflower to the same basket and steam until al dente. Set these aside. For a restaurant style, you can skip steaming and shallow fry these until half cooked and aromatic. Set these aside. Make a paste of onions. Set aside. In the same jar blend tomatoes and cashews to a fine paste. You can also blend onions, tomatoes and cashews together if you are short of time. But sauteing them separately yields a better tasting gravy in this recipe. 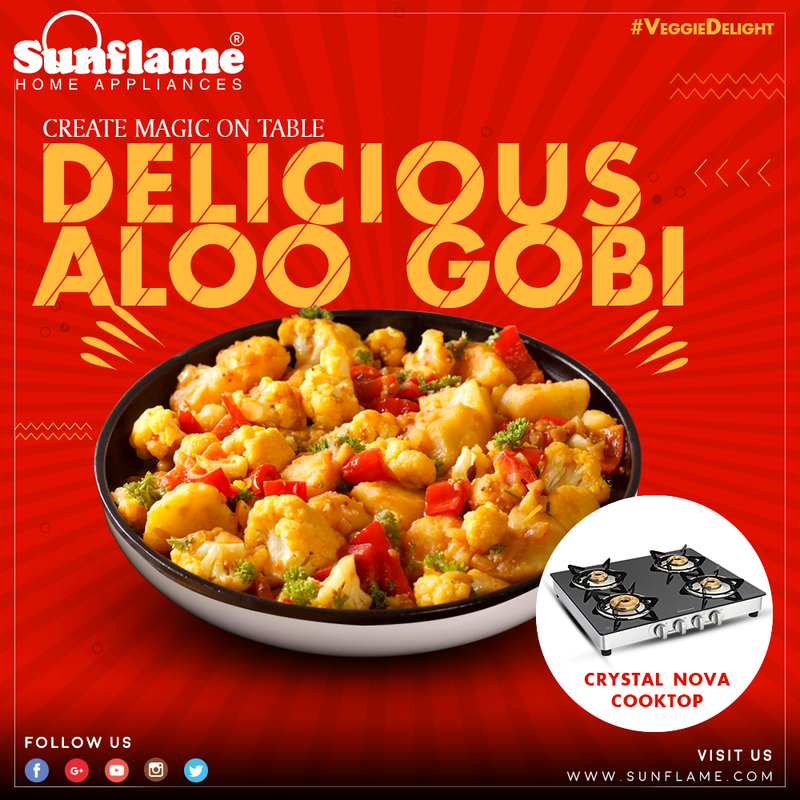 Heat a pan with oil on Sunflame Crystal Nova Cooktop, add cumin and allow to splutter. Add ginger garlic paste and saute until the raw smell goes off. Add the onion paste and cook until the paste turns light golden and the raw smell goes away. Add tomato paste and cook until the masala turns thick and evaporates all the moisture. Add red chili powder, garam masala, turmeric and salt. Cook until the masala begins to leave the sides of the pan. Then add 1 ¼ cup water and stir well. Cook until the gravy thickens slightly. Add the steamed or fried aloo gobi to the gravy. Cover and simmer until the veggies are cooked completely. Add kasuri meti. Switch offf. Add coriander leaves. Serve aloo gobi masala with rice or roti.